Let me be direct and say that many web design firms don’t get it. They attempt to be all things to all customers. If you have listened to previous episodes here, you understand that is dangerous. Jennifer Bourn gets it, and it shows in how she runs her company. She really understands her customers and she knows how to market herself so that they self select themselves for their services. They know they want to work with her company before they get on the phone. In this interview, we talk about what got her to this strategy and the success that this approach has provided her company. The moral of this episode is you really must know your customers and what they want so that you can be the company they want to buy from. Jennifer’s Target Audience: Jennifer runs a firm that builds lead generation WordPress sites as well as the branded platforms that offer support for her clients’ sites and their brands. Jennifer’s clients are service-based small companies and entrepreneurs who are growing online businesses and want to take their businesses to the next level. She typically works with clients who are already successful, earning six-figures and up. Today Jennifer runs a thriving and successful strategic design firm that works with entrepreneurs and small businesses ready to take their game to the next level. Bourn Creative is her company and the company’s website is a reflection of the pivotal role the company has played in their clients’ success. The branding and messaging of Bourn Creative is not all about what’s great about them, it’s what is great about what they do for their clients. 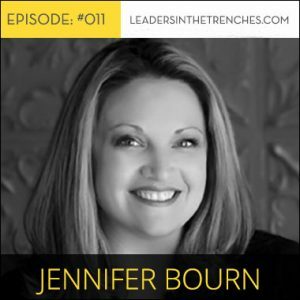 The reason Jennifer has positioned Bourn Creative that way is that she’s learned the success you provide for others is the way to gain more clients and even greater success. It’s not tooting your own horn, but rather tooting the horn of what you’ve done for your clients. She’s learned that by providing success and tracking the results of what her company provides, she’s able to show prospective clients what’s in it for them if they choose to work with her company. It’s why she has niched down to a select group, and why her branding is focused on her consumers. It takes time to get narrow and to get narrow right. What is the definition of “stacking success”? Why her site has been paired down to the bare essentials. The are 3 core ways people can engage with you: what they are and how to use them effectively in your business. How she and her team have chosen who they do NOT work with. How she has difficult conversations with her clients. Making the shift in your brand from being you-centric to consumer-centric. When to level up, what it is and how to do it properly. The two questions to ask your new clients. The one thing I have seen that makes a significant shift in people’s businesses and a specific example. Jennifer believes if you’re new to the business, the best thing you can do is to take action. She says to go to a site like Studiopress.com, or Woo Themes and purchase a theme off the shelf. Get your site up and get to market with something. She says to start serving clients and tweak as you go; you’ll start seeing what people are actually resonating with in your message. When new clients come to you, be sure to ask them what they resonated with from your site and what was it on your site that got them to call you. Jennifer believes in the power of tracking: “…when you start tracking those things, you can start to look at where you want to embellish your site and add more to your site. Where you really want to focus on the things that are working….” If you are getting some practice and some insights from the real world, then you can get some clarity about working with people; you can see who you like working with and who you don’t. Then and only then should you look at investing in a higher level site and expanding your offerings. Do you have questions about today’s episode!?! Did you know that you can apply to chat with me by phone? This is a limited time offer to help anyone that is serious about refining their business as well as developing a clear & compelling strategy that will drive them forward. Complete the questions and our team will follow up with you to schedule time for your “Business Breakthrough Session”. These are limited to 30 minutes, completely free and oh, so valuable. (Hint: these are similar to the conversations I had with Jason to help him fine tune and launch his lifestyle business.) Apply Now! 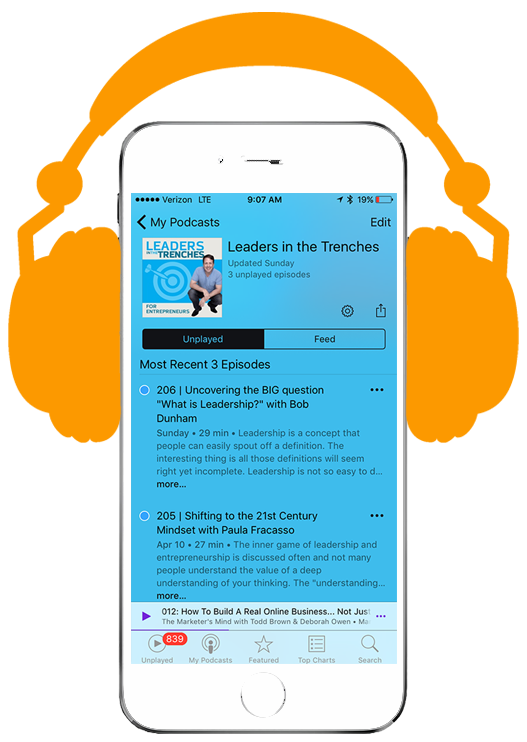 And lastly, please leave a rating and review for the Leaders in the Trenches on iTunes (or Stitcher) – it will help us in many ways, but it also inspires us to keep doing what we are doing here. Thank you in advance! TRANSCRIPT The transcript will be available shortly – thank you! Right click to download the .mp3.